The language whose phonology is described in this work is standard Hindi, i.e., the Hindi used in everyday casual speech by educated native speakers in cities such as Varanasi, Lucknow, Delhi etc., which is different from highly Sanskritized Hindi called literary style Hindi and highly Perso-Arabicized Urdu, a native speaker being one who has learnt the language as his first language. The author's interest lies in accounting for the Hindi speakers competence i.e., providing evidence for the psychological reality of certain sound patterns of Hindi. This study is a mixture of two types of evidence. Some evidence is provided from experimental data and other is from hypercorrection, from children's mistakes, from native speakers, reactions to certain forms. The model used is that of generative phonology with modifications suggested throughout. The work is divided into six chapters. The first chapter deals with the segments of Hindi that need to be recognized as phonemes. Chapter 2 deals with current morpheme structure theory, and some suggested revisions of it. Chapter 3 discusses the 'abstractness' issue. Chapter 4 gives a detailed account of the initial, medial and final clusters of Hindi, and gives the if-then sequntial constraints necessary to account for these. Chapter 5 has two parts, the first discussing the problem of nasalization in Hindi and the second dealing with the issue of homorganic nasals in Hindi. The sixth chapter discusses the e-deletion rule in Hindi. Manjari Ohala (Ph.D., University of California at Los Angels) is an assistant professor in the Linguistics Program at San Jose State University. She has published several articles on Hindi phonology and phonetics in Journals such as Language, Lingua, and Indian Linguistics. The language whose phonology is described in this work is Standard Hindi. The principal informant, myself is a third generation native speaker of Standard Hindi. Even though the dialect being described is mine, I have made every effort to verify that the description applies to other speakers as well; their responses and judgements have been noted throughout} The Hindi that I am referring to is used in everyday casual speech by educated native speakers in cities such as Banaras, Lucknow, Delhi, etc. It is contended that the difference between speakers of these cities is minimal. Some writers (e.g., Gumperz and Naim 1960, Kelkar 1968) have used the term ‘Hindi-Urdu’ for the variety being described here and for which I have used the term ‘Hindi’. The hyphenated term implies that the language described contains what is common to Hindi and Urdu, i.e., it is not the highly Sanskritized Hindi (‘high Hindi’, or what is called literary style Hindi), nor the highly Perso-Arabicized Urdu (‘high Urdu’, or what is called the literary style Urdu). In other words, it is the dialect spoken by educated urban speakers in casual conversation. For a detailed account of the different functions of ‘high Hindi’, ‘high Urdu’, and ‘Hindi-Urdu’, see Kelkar. Henceforth I will use the terms ‘Hindi’, and ‘Standard Hindi’ interchangeably. When I describe characteristics of ‘high Hindi’, ‘high Urdu’, or other dialects of Hindi (e.g., the rural dialects), ‘I explicitly name the dialect. There are those who doubt that native speakers of Standard Hindi exist, so it is best to be quite clear as to what is meant by a native speaker. Generally, by a native speaker of a language is meant one who has learned that language as his first language?-‘at his mother’s knee’. This work is entitled ‘Aspects of Hindi Phonology’. Naturally, the precise form of phonology of a language will be different depending on the goal. If the aim is simply descriptive then one is "merely cataloging the results of interacting historical processes" (Ladefoged l97la: 49). In a grammar of this type, as long as the description notes the existing regularities or patterns in the sound system of the language and states these patterns as generally as possible, it will be justified. And of course there might be a number of descriptions which will be equally valid in this kind of treatment of the data. In such a grammar abstract forms could be posited without any further justification than the fact that it is possible to state certain regularities if one assume them. As Ladefoged has pointed out, this is what Chomsky and Halle’s analysis in Sound Pattern of English amounts to. This is true in spite of the modern phonologists’ claim that they wish to describe the competence of the native speaker, that is, what he ‘knows’ (tacitly) about the system of his language. In fact, a large number of grammars written in the generative format, in that they lack empirical verification, cannot be assumed to represent grammars of competence, but simply descriptive grammars. On the other hand, instead of description, our goal might be ‘explantion’ of sound patterns. As J. Ohala (I974) has pointed out, a grammar whose purpose is explanation will have to differentiate between those sound patterns which a native speaker is ‘aware’ of and uses productively and those that are in the language simply due to usage. However it is not simply the goals of the linguist that make the defference between a competence grammar and a purely descriptive grammar because, as has Already been pointed out, generativists have always aimed for a competence grammar. The key difference lies in what evidence is provided for the ‘psychological reality’ or lack of it for a given sound pattern. The provided however cannot simply be the fact that a pattern exists and can be formally stated. As Zimmer has remarked, "It is occasionally assumed that, if a regularity can be stated, this alone permits us to infer some kind of psychological reality" (1969: 309). Zimmer gives experimental evidence that this assumption is not justified. Nor can the evidence simply he that all the formally stated rules ‘work’ because as Ladefoged has recently pointed out, "Nothing is proved about present day psychological reality by the fact that these unverified guesses all knit together, supporting each other by forming an intricate system of rules" (50). If the aim of our grammar is to account for a speaker’s competence, then of course we will have to provide evidence that what we are claiming as part of a speaker’s ‘knowledge’ is indeed such. Appropriate experimental procedures fordoing this can be found in such studies as Greenberg and Jenkins (I964), Zimmer (1969), J. Ohala (l974), Derwing and Baker (1997). Although construction of a good descriptive grammar is by no means a trivial task, my own interest lies in accounting for the Hindi speakers’ I competence, i.e., providing evidence for the psychological reality of certain sound patterns of Hindi. However if I restrict myself to stating just those patterns for whose psychological reality I had evidence, then l would not he able to say very much about the sound patterns of Hindi. Therefore this study is a mixture of two things. In a number of cases I have tried to provide evidence for the particular analysis I have chosen. Hoare of the evidence is from experimental data. Other evidence is of a varied sort; from hypercorrection, from children’s mistakes, from native speakers` reactions to certain forms,`e.g., their regularization of exceptions, their not deleting certain segments that meet the environment of a rule and their different responses to the same item under different circumstances. In those cases where I have adopted certain analyses without much evidence, I have generally labelled these as descriptions or as points requiring further testing. The model used in this work is that of generative phonology, with modifications suggested throughout. Since linguistic theory is still in the stage of finding out relevant facts about languages that need to be incorporated, whenever the current theory was found to be inadequate in some way in accounting for the facts of Hindi in the most explanatory manner, I have chosen to modify the theory. It has been assumed by generative phonologists that there is a unique grammar of a language, the one that the child chooses. While I don’t think this is the case (I discuss this more in Chapter 3), certainly the number of such grammars that could he said to he competence grammars will be quite limited since there are undoubtedly severe restrictions 0n the kind of representation such knowledge can have in the brain. An evaluation procedure or metric is posited by the generativists to measure the complexity of the grammar in order to filter out non optimal grammars. However none of the proposed evaluation metrics have met with any success or universal endorsement by linguists (see Fromkin l971b). This is not surprising since little attempt has been undertaken to find out what the functional constraints of the human brain are. Therefore my grammar is not restricted by any of the proposed evaluation metrics. That is, it is not the case that I have chosen or rejected an analysis solely on the basis of how it would add to the complexity of a gram- mar. Lacking information on how phonological facts are represented in the brain, it seems to me preferable at this point to try to account for the sound patterns in intuitively the best way and try to secure evidence for the ‘psychological reality’ or productivity of the particular analysis. We can worry about the exact formalism of the productive rules in the speakers’ head later. I have indicated in a number of cases the kind of test or evidence that would be required so that future studies might reveal the inadequacies of my analysis or, hopefully, justify my analysis. In any case I have tried to be explicit about my reasons for adopting the particular analyses that I have chosen. I have no illusions that this study is the last word on the aspects of Hindi that it touches on. There are a number of open questions on certain points since experimental evidence could not be obtained due to limited resources and time. I hope that linguists working on linguistic theory and linguists interested in details of Hindi phonology will both find something of interest in this study. The first chapter deals with the segments of Hindi that need to be recognized as phonemes, the problem of certain segments that occur only in loans, the features used, including some modifications of the conventional Chomsky and Halle features, and a few segment structure conditions of Hindi. Appendix I discusses the Chomsky and Halle feature ‘heightened sub glottal pressure’ for Hindi aspirates, and provides experimental evidence indicating its inappropriateness for Hindi. Chapter 2 deals with current morpheme structure theory, and some suggested revisions of it. The first part of this chapter discusses various theoretical issues surrounding morpheme structure conditions (MSC’s) including their psychological reality, and the second part, the issue of their domain. Chapter 3 discusses the ‘abstractness’ issue. I provide some experimental evidence for the ‘psychological reality’ of certain ‘abstract’ segments in Hindi. Chapter 4 gives a detailed account of the initial, mendial, and final clusters of Hindi, and gives the if-then sequential constraints necessary to account for these. 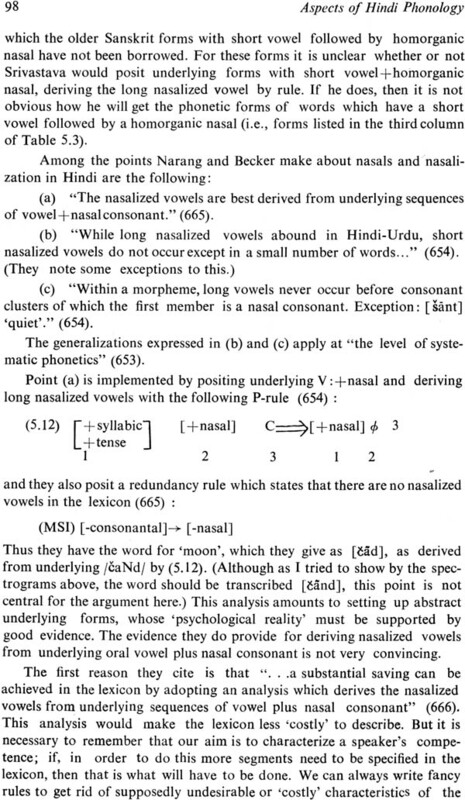 Appendix 2 reports a test conducted to investigate the psychological reality of certain morpheme-initial consonant cluster constraints in Hindi. Appendix 3 lists examples of the various clusters. The first part of Chapter 5 discusses the problem of nasalization in Hindi, and provides instrumental evidence to show that what is claimed to be [V: C] in Hindi is, in a number of cases, [V: NC] (where N=homorganic nasal). Instrumental evidence is also provided on degrees of velic opening during nasalization in different phonetic environments. The second part of Chapter 5 deals with the issue of homorganic nasals in Hindi. 2.1.2 On what does a speaker base his reaction to new morphemes?